The Fast Grip gives your hands the moisture-resistant dryness needed for those fast draws and a sure grip, with none of that white chalky residue that other creams leave behind. Produced, endorsed, and used daily by a multiple World Champion! Eric Grauffel is the current World IPSC Champion. He has won more IPSC Championships in the past several years than any other top IPSC professional competitor! Being a multiple World Champion means that Eric can be very selective in his choice of equipment and accessories. He uses what he feels is the best! 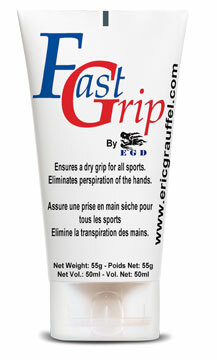 FAST GRIP hand cream is the result of extensive research and development by Eric in conjunction with a French company. Fast Grip gives your hands the moisture resistant dryness needed for those fast draws and a sure grip, with none of that white chalky residue that other creams leave on your pants, range bag, and gun! No more nervous sweaty palms! Your hands remain dry for hours regardless of the climate conditions. This product is not only used and endorsed by the World Champion, it bears his name! Try it today and see the results for yourself.